As I was riding home, down Broadway last week in the bright winter sunshine, I was attempted to boost my spirits by taking some solace in my health, family and general robust nature. You see I had just had a dispiriting job interview. I am not alone, but that does not necessarily make things better. It does make them different. Sometimes the fact that we are all in it together, mounts arguments that sooth sometimes and at other times it exacerbates the fear that I , that none of us. will ever find gainful employment again. I know that I am in a much better place than many of my fellow citizens and yet whatever challenges we face as a nation, we also face personal demons a plenty. I have an ability to go to what my son called, when he was little, “The Dark Place”. This mythical kingdom needs no introduction, for whether we have named it or not, all of us have visited there. Some of us have taken up summer residence or gotten graduate degrees there. It is the place where we can’t get out of our own way, where we are afraid and can’t find a hand to hold, or a cat to pet. And so we simmer and stew in our own private negative juices. And certainly the current ingredients for the “Dark Place” abound: war, unemployment, debt, bad choices, a lasting legacy of privation for our children and a fear that accompanies even one of these, let alone the concatenation that is in full bloom. But then there are the antidotes to doom. The antidotes are so simple, so unbidden, free and surprising that they take my breath away. They are friendship, laughter, kisses in corners, questions, conversation, music, dappled sunshine, home cooked meals, gleeful kids, crazy cats and the magic of everyday. Oh everyone’s list varies, this is a quick fix mediation for me, but add to that list serendipity. And so as I peddled by 1968 Raleigh bike down Broadway from the Upper East Side to the Downtown neighborhoods I love, I chanced a glance at the red stone wall at 707 Broadway just above 4th Street and there it was. Chalked in a neat hand were the words DONATE JOY. I rode past. No I couldn’t ignore this universe message; I wheeled my bike around and pushed it against traffic and up onto the sidewalk. I stood in front of the message, OK I know it is graffiti, but it changed my mind set as clearly as if someone had shot a personal remote control at my gloom. I was on a new channel. I took out my little camera and click, I saved the image and the sentiment. 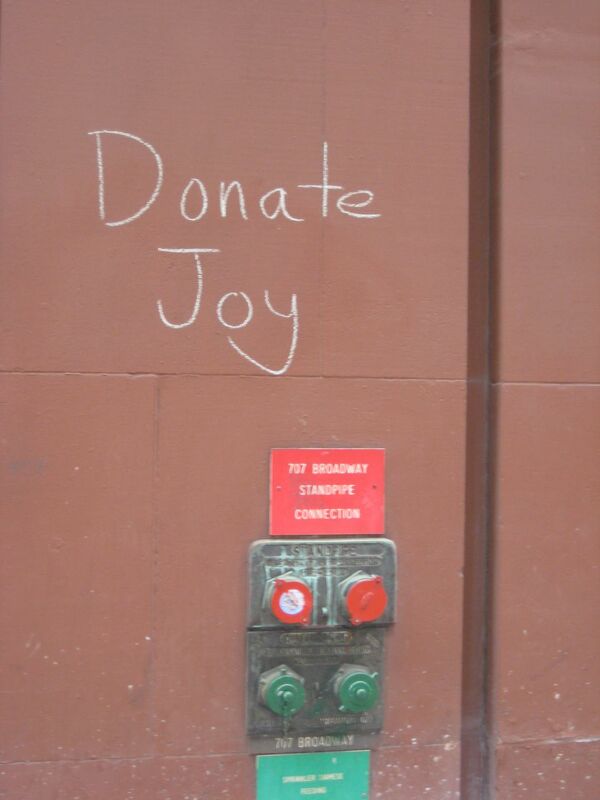 I have been thinking about what it means to “Donate Joy.” I attempt to offer smiles to folks on the street, I compliment women on lavish hats, I stop and help mothers with strollers, I make crying babies laugh, I hold doors, I proffer help, but is that joy ? How can I donate joy ? Do we donate joy when we don’t participate in passing along gossip, or hatred or fear or racism? Do we donate joy when we really laugh with our friends and children and not at them? I am still on a path to figure out, not what joy is, because I have the essence of joy sewn to me like a second shadow, but how do I donate it , or it or pass it along ? I have been detouring and riding past by the scrawling every chance I get. I know it won’t last forever. so we have to pass it along quickly before it dissolves. I have lived in Tribeca for over 30 years and certainly in its graying, last decade, when its residents either got just older, or older and riche, it has seemed as if my neighborhood was a very indifferent place, politically. Many of us who came of age in the Mark Rudd, S.D.S. anit-war protests of the ’60s and ’70s, of late have tread the road more taken. The political apathy of the generation formerly known as activist, rabble rousers is renowned — as we are more often cited for parenting vigor or traveling aggressively. But on Monday night, the official observance of Martin Luther King’s birthday, and the same night that three Democratic candidates were slinging mud in a debate, there was a political meeting in Tribeca. It was the brain child of an unlikely foursome: Downtown resident Ruth Charney who offered her big loft in the old Bob DeNiro, Harvey Keitel building on Hudson St.; activist comedian Reno who is the resident celebrity in my building on North Moore St.; long time Obama friend, and supporter, the lawyer David Carden; and the final member being economist Jeffrey Shafer, currently the head economist and political strategist at Citigroup’s global banking division. These four had met at a previous Obama rally, and Jeffrey Shafer and Reno concluded that if the Obama movement could bring together souls as disparate as they are, then there must be something more happening. And so they endeavored to set up a Tribeca meeting designed to allow undecided voters to gather information about Barack Obama, the man and candidate. Certainly this evening, when dozens of neighbors rallied to share their thoughts, ideas and stories, had gone a long way to providing the assembled with both facts and the effect surrounding Barack Obama. It also had perhaps the unintended effect of uniting us as a community. We forget that we have to listen to our neighbors, know their stories, as well as our own and respect our differences and the vibrant similarities. Yes, information was shared, but the energy, the belief that we can still be passionate was the most important byproduct for this too often apathetic voter.